This afternoon, 3HP were set a problem solving challenge. The challenge set was to build the tallest tower possible which could also balance a ball at the top. The children were given scrap paper, scissors, glue and anything else they chose to help them in their building activity. 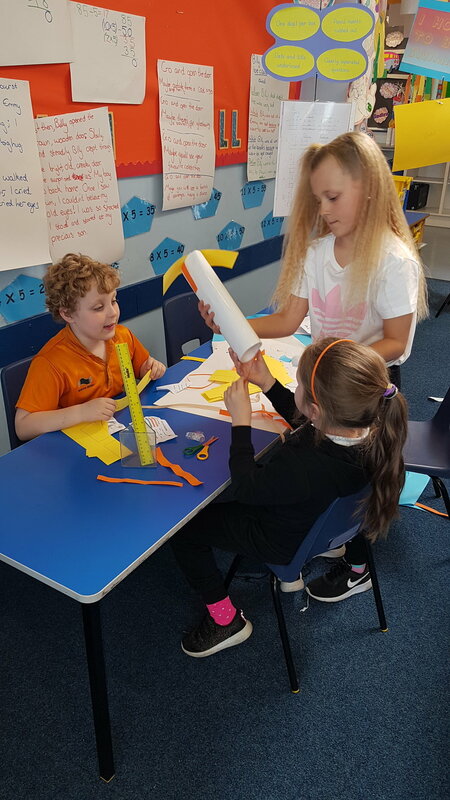 Not only did the children have to build the tallest paper tower to balance a ball on, but they were also given team points for team work, positive thinking and for praising each other. All teams successfully managed to work as a group using great growth mindset and positivity to attack their challenge! What really impressed Miss Price was how well 3HP worked together to over come the challenges they faced and how kind and supportive they were to each other. Each group successfully built a fantastic tall towers, with the tallest being over 1 meter! The tower building was only half of the battle! After that, was the test to see whether the ball could balance on the towers. Some teams were successful and others weren’t as successful, however, that did not take the smiles off 3HP because even though it’s great to succeed we also know that it’s about trying and never giving up! The children were asked about the strategies they used to complete the challenges successfully: “Positivity!” “Perseverance” “Team work” “Never giving up and trying different ways to make things work” “Having fun” “Being determined to succeed”. These are all qualities of growth mind set: with resilience, perseverance and determination they all achieved success.